Hi, my name is Kendyl. I am a fiber-holic. I've been proudly obsessed with knitting for two complete years. I just remembered that I first picked up the needles sometime in late October of 2006 so today is around my 2nd knitaversary. Yea me. In those 2 years I've churned out some 70 projects, learned cables, lace, felting, fair isle and entrelac, dyed some yarn and designed a few tops. My motto has been, "Bring it On! It's just string, after all!" Learned so much, yet everyday I am completely humbled by the true artists and technicians that I see on Ravelry and the blog-o-sphere. I love that there are always new mountains to climb. Speaking of which, here is my current challenge, my personal mountain. This what I refer to (in my own mind) as "true" fair isle. This is the sort of color work that makes my heart sing. 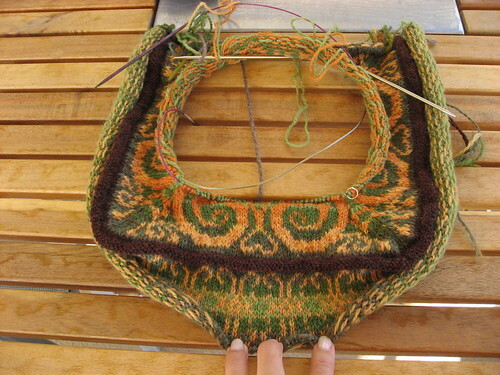 Someday, when I am a true Knitter (with a capital K) I will knit the Venezia Sweater by Eunny Jang. Dudes, this sweater is a work of art and unless I move somewhere drastic (like a place that actually gets cold) art is all this will ever be. When I knit it I'm thinking I'll have it framed in some Plexiglas box and hang it on the friggen' wall. Here is Sipalu, my color work trial. This is a kit, available from Knit Picks and it is a thing of utter beauty. It is also a major bargain. I got 17 full balls of Palette yarn along with this pattern. They say you make 2 or 3 purses from all this yarn! This project is completely consuming and I need mindless knitting to switch it up. That's where Cobblestone comes in. I did the sleeves first and I am nearly done with the body. My honey is going to look stunning and oh, so manly, in this sweater. Yum! Just a catch up note, I finally got around to finishing my Lombardy Socks. 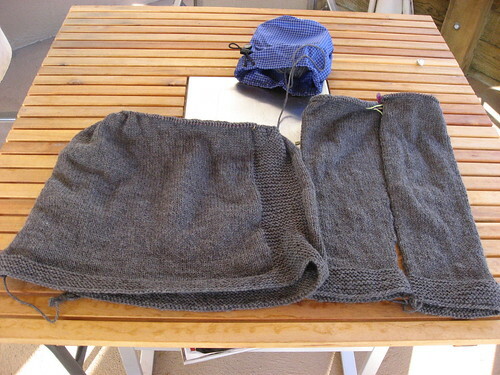 Knit with Shi Bu knits yarn, the socks are lovely and I loved doing the picot edge. Apparently everyone, but me, knows that ShiBu pools horribly on socks. Fortunately you can't really tell on this dark blue color unless you look closely. Dudes, if anyone other than my honey is that close to my feet I got other problems, ya know? !